The Boston Terrier was developed from larger dogs that were used for the brutal sport of dog fighting. Today's breed is much smaller than its ancestors and makes an excellent companion. 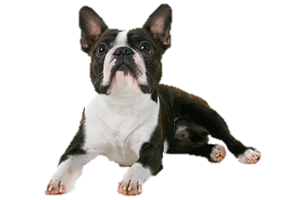 The history of the Boston Terrier begins with an old style Bulldog and the now extinct English White Terrier cross that was born in Liverpool, England in 1870. He became purchased by Robert Hooper of Boston and became known as Hooper's Judge. Judge was larger than the modern day breed, weighing over 30 pounds. His offspring became the foundation for the stock and it is believed that they were later crossed with French Bulldogs and possibly other breeds such as Bull Terriers to broaden the gene pool. Originally named the American Bull Terrier, the name was changed to Boston Terrier to honor the breeds “birthplace”. Is the Boston Terrier Right for You?